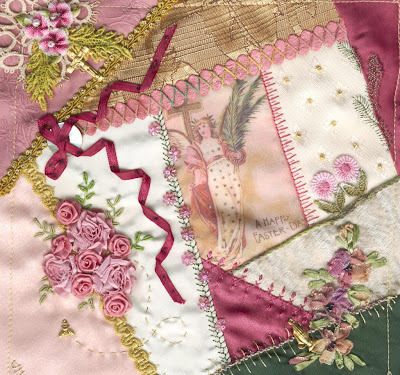 These two blocks are very similar in colour even though the only common fabric is the rose pink satin. The one at the top was for Sandie who very kindly hosted the Easter Gathering. 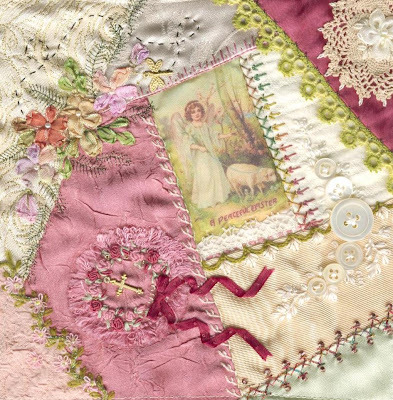 Sandie loves pink so although the picture in the centre was of a darling little Angel walking a pet lamb (Sandie's an animal lover) and mostly greens and creams, there was enough pink in there for me to add pink fabrics and threads. I was really happy with the way the colours combined to create a sort of harmoneous feeling. The bottom one was for Julia who is primarily a "Victorian" person and loves sludgy colours. She does the most gorgeous crazy quilting using colours on a black background - something I have yet to muster up the courage to try. Her picture was a Victorian style Angel with palm leaves which set the tone of the block. I remember telling Julia that I was working on a block with an Angel in a cream dress with a rose pink shawl around her shoulders and asking her to guess who it was for. "Well, it can't be for me - it must be Sandie's!!" she answered.........which put me off a bit so it got put to the back of the list while I thought about it. In the end, I was happy with it and I think she was too. I love my block Viv...can't wait to have it here in my hot little hands!.